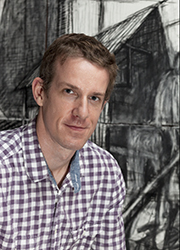 Christopher Troutman joined the art faculty in 2013. He received his Master of Fine Arts in drawing and painting from California State University, Long Beach in 2008 and his Bachelor of Fine Arts in drawing and painting from Bradley University in 2003. Before teaching at Lamar, Mr. Troutman taught painting and drawing at Eastern Kentucky University, painting and design at Vincennes University, and painting and drawing at Eastern Illinois University. Currently at Lamar, his teaching focuses on all levels of drawing. As a teacher, Mr. Troutman teaches drawing with an emphasis on skills and technique to provide beginning students with the formal tools necessary to develop individual content in advanced level courses and to use drawing to explore visual ideas in other media. To do so, he teaches observational drawing as a means to understand the visual world, enabling students to develop fluidity with basic drawing materials. His hope is for students to advance their perceptual limitations as well as critical judgment. This is followed by assignments that encourage development of personal content as a transition to advanced studies where students refine their ideas and create a body of artwork, competitive with artists in the field. In his research, Mr. Troutman draws human figures in contemporary urban settings and amplifies figures and spaces by presenting them from unusual points of view in order to suggest the latent potential in everyday subject matter. He also frequently divides his drawings into multiple sections to suggest the passage of time to enhance narrative and as a means to juxtapose aspects of the United States and Japan, which is where he and his family return to each summer. Mr. Troutman has joined group exhibitions in China, Hungary, and Germany, annually exhibits in group exhibitions in Japan, and has had solo exhibitions there in the past. Each year in the U.S., he has solo exhibitions and joins several group exhibitions. His work has been presented in the Bradley International Print and Drawing Exhibition and Manifest Gallery’s International Drawing Annual multiple times, and he has had solo exhibits at the galleries at Louisiana Tech University, Bradley University, University of Rochester and the Kansas City Artists Coalition.